Turn master data into competitive advantage with integrated master data management solutions built on a single, proven multidomain technology platform. Comprehensive master data management built for a complex data-driven world. Business today depends on data. Stibo Systems puts you in control with a suite of solutions built to deliver competitive advantage in an increasingly competitive business environment. Stibo Systems’ solutions for multidomain MDM empower you to leverage data from across the enterprise to create a single source of truth that enables superior-decision making and business outcomes. By eliminating data silos and seamlessly integrating master data from multiple domains, our solutions enable IT and business leaders to improve data accuracy and visibility across every aspect of the business. And because no two organizations are alike, our solutions are designed to adapt to an organization’s unique needs, and scale with their needs as they evolve and grow. That’s the power of master data management solutions that put Your business first. Integrated solutions that put Your business first. A BUSINESS FIRST APPROACH TO THE CLOUD MDM built for where you are today – and where you’re going tomorrow – on your journey to the cloud. Everyone’s data infrastructure and technology roadmap are unique. Stibo Systems’ MDM solutions are built for your evolving needs, offering the flexibility of both on-premises and fully-managed cloud-based options. 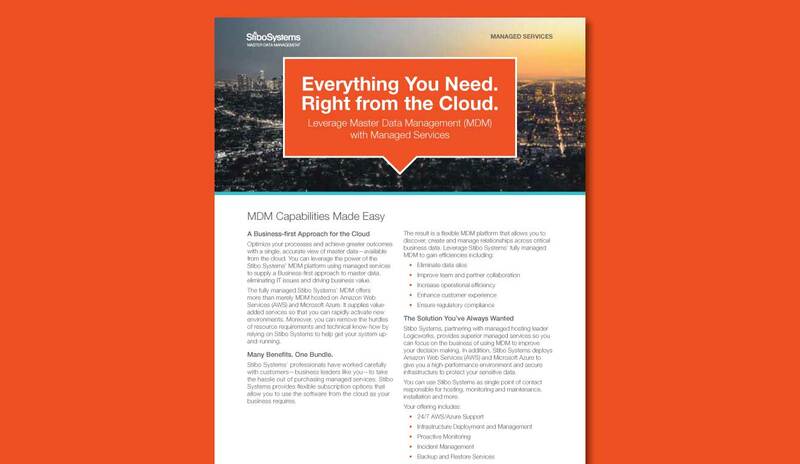 Learn more about MDM delivered at the speed of the cloud. An innovative approach to addressing rapidly unfolding market trends. Globalization A solution that works across the enterprise, capable of addressing both local requirements and multiple languages. Business agility Adapt to evolving market conditions using Multidomain MDM that scales with your business, delivered on-premises or in the cloud. Customer experience Combine customer data from different systems into a single “golden record” to enable personalized experiences. Digital transformation Explore innovative new business initiatives through enablement of emerging technologies and by turning master data into an actionable strategic asset. Merchandizing Leverage a single source of truth for your product and customer data that supports private labeling, dynamic assortments and targeted product branding. Time to value The flexibility of Multidomain MDM allows new integrations and adding attributes that drive value without time consuming reprogramming. Process optimization Data syndication and synchronization ensures the use of quality data for every workflow. Sustainability Facilitate documentation of materials, supplier certifications and recyclability. Compliance Provide data visibility for compliance with industry and trade standards as well as privacy regulations. MDM enables innovative companies to achieve great results. 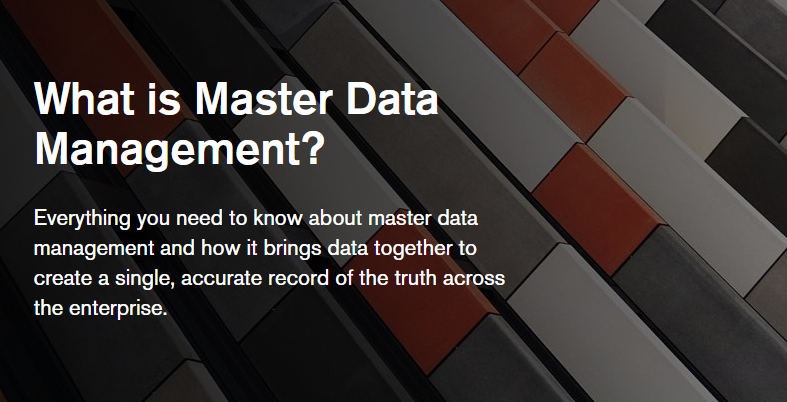 A great place to start is with our comprehensive guide, What is Master Data Management? Multidomain MDM enables business advantages. Enable new business models Combine data across domains, such as customer and product to connect parts and service deals. Or product and location to drive real-time personalized offers. 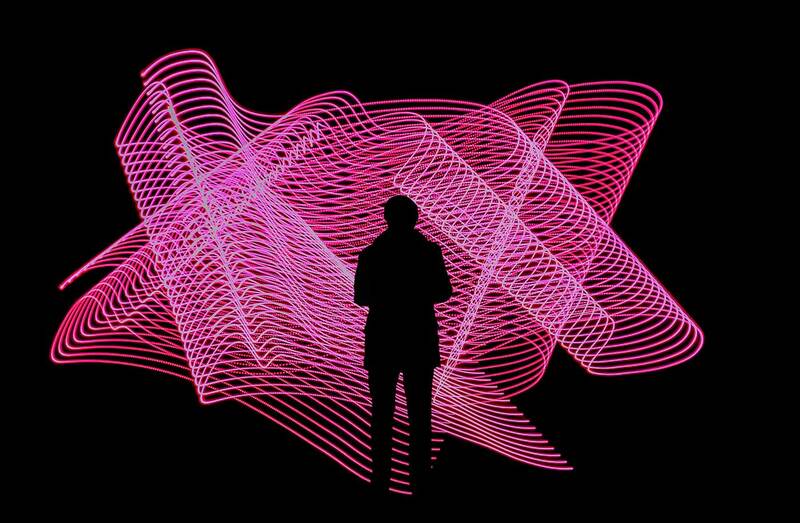 Drive differentiated experiences Combine operational, transactional and behavioral data to fuel innovative, personalized experiences that spur customer loyalty and business growth. Integrate everything Connect , share and leverage data from disparate siloed sources such as ERP, CRM, ecommerce, warehouse, POS and legacy apps, as well as with third-parties and external partners.